Response rates and median survival (MS; □) in small cell lung cancer (SCLC) and nonsmall cell lung cancer (NSCLC). 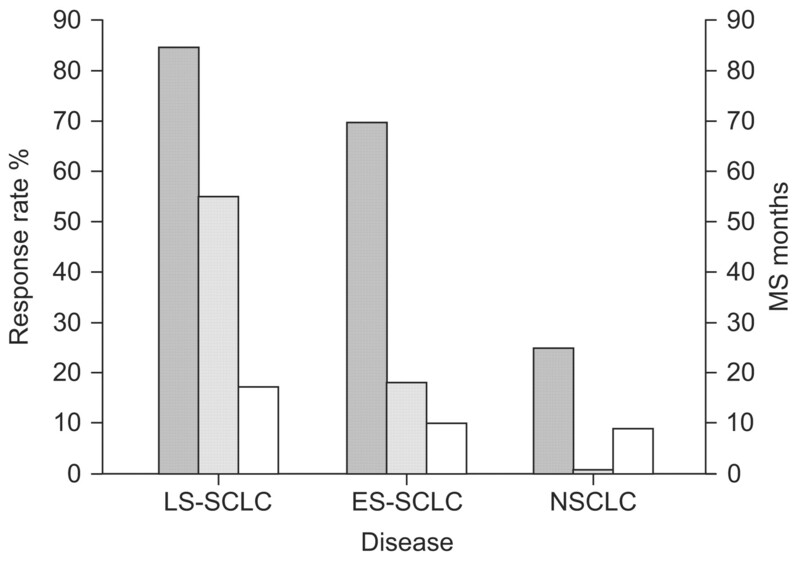 Response rates in SCLC are much higher than in NSCLC, although MS remains poor. The overall response (▓) ranges 80–90% in limited-stage SCLC (LS-SCLC), 60–80% in extensive-stage SCLC (ES-SCLC) and 20–28% in advanced-stage NSCLC. Complete responses (░) are noted in SCLC (50–60% in LS-SCLC and 15–20% in ES-SCLC), whereas this is almost never the case in NSCLC. Despite these impressive response rates, MS is only 14–20 months in LS-SCLC and 8–13 months in ES-SCLC, compared to 8–11 months in advanced-stage NSCLC. 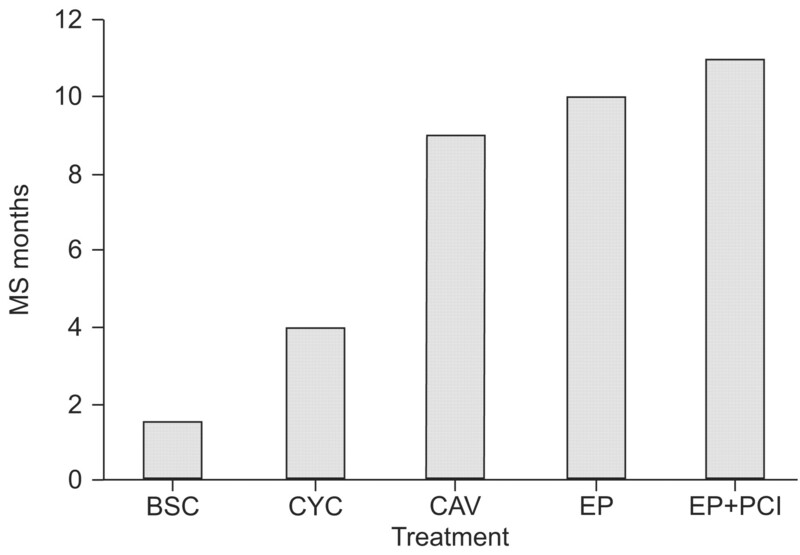 Median survival (MS) in extensive-stage small cell lung cancer with various treatments developed since the 1960s. BSC: best supportive care; CYC: cyclophosphamide; CAV: cyclophosphamide, doxorubicin and vincristine; EP: etoposide and platin; PCI: prophylactic cranial irradiation. OR: overall response; CR: complete response; CTC: common toxicity criteria; NP: neutropenia; TP: thrombocytopenia; JCOG: Japanese Clinical Oncology Group. #: nausea/vomiting; ¶ diarrhoea; +: infections. Time to progression (TTP) and survival are presented as medians. OR: overall response; CR: complete response; PR: partial response; SD: stable disease; CAV: cyclophosphamide, doxorubicin and vincristine; BSC: best supportive care. OR: overall response; OS: overall survival; PR: partial response; S: sensitive (initially responded and then relapsed/progressed within 60–180 days); Rs: resistant (initially responded to first-line platinum-containing chemotherapy and then relapsed/progressed within 60–90 days); Rf: refractory (failed or progressed with first-line platinum-containing chemotherapy). RR: response rate; OS: overall survival; PFS: progression-free survival; TK: tyrosine kinase; EP: etoposide and cisplatin; IP: irinotecan and cisplatin; PCDE: cisplatin, cyclophosphamide, 4’-epidoxorubicin and etoposide; Rs: resistant; S: sensitive; c-kit: mast/stem cell growth factor receptor; ES: extensive stage; UT: untreated; PD: progressive disease; LS: limited stage; CR: complete response; PR: partial response; SD: stable disease; OR: overall response; ns: nonsignificant. ACCP: American College of Chest Physicians; ESMO: European Society for Medical Oncology; NICE: UK National Institute for Clinical Excellence; NCCN: National Comprehensive Cancer Network; PCI: prophylactic cranial irradiation; EP: etoposide and cisplatin; EC: etoposide and carboplatin; IP: irinotecan and cisplatin; IC: irinotecan and carboplatin; CAV: cyclophosphamide, doxorubicin and vincristine; CR: complete response; PS: performance status; PR: partial response.